No wonder Bruce Judson is such a big fan of the Internet. A conversation with him moves at lightning speed, his answers are rapid-fire, and he is a wealth of information. And Judson knows a thing or two about the Internet and how to use it for strategic advantage. In his early days at Time Warner, where he started as a director of marketing of the company's magazine division, he was one of the first people to see the Internet's enormous potential to increase sales and market share. Judson held several positions at the media giant, and each involved innovation and technology. In his role as general manager of new media at Time, Inc., Judson took the lead in showing how technology could be used to bring revenues and profits to the organization. Judson is quoted often in leading U.S. business publications and has written several bestselling books about the Internet. 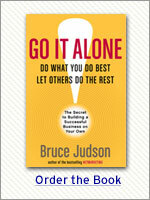 His latest book, Go It Alone!, explores the theme that's spelled out in the book's subtitle: Do What You Do Best - Let Others Do the Rest. He recently was quoted by The Wall Street Journal as saying that "The saddest aspect of work today is that most people aren't doing what they're best at. A 2004 Gallup Poll found that only 20% of employees feel like they have the opportunity at work to do what they do best every day. But the problem is that a lot of people aren't sure what their strengths are." Judson certainly knows where his natural talents lie. "The first time I saw the Internet," he says, "I looked at it, and something clicked inside me. I had a natural affinity for it. I understood it. I could visualize how it would play out. I saw that it would be significant and that it meshed with my abilities." Judson's first book, NetMarketing, was, in his words, an "unexpected bestseller." And the focus of his current book could be liberating news to the people around the world who want to strike out on their own and start their own business. Go It Alone! says they can do just that -- and today's technology allows them to accomplish that with less risk and investment than they might think. Judson's message should also resonate with enterprising managers and employees in established companies who may not want to break out on their own, but who want to push their organizations in new and innovative directions. Judson is a senior faculty fellow at the Yale School of Management, an entrepreneur, a father and husband, and he received advanced degrees from both Yale Law School and the Yale School of Management. In this interview, he dispels myths about what it takes to start a business, describes the traits that successful entrepreneurs share, and offers opinions on where technology is leading the global marketplace. GMJ: What prompted you to write Go It Alone!? Bruce Judson: Three very strong influences prompted it. First, we have this extraordinarily large group of people who have left corporate America not by choice, and no matter how strongly the economy comes back, they will not be reabsorbed by the corporate sector. They are people who are used to having a certain income, and I thought they would benefit from this. Second, there is a large group of people who are unhappy in what they are doing. I would classify them as "underemployed," meaning that they really want to be doing other things. There have also been a number of studies that have talked about the large number of individuals who want to be on their own. Third, I wanted to dispel the almost mythical notion that starting a business required raising a lot of money and having a lot of employees or that there always had to be enormous risks. I believed that I had developed ways to dramatically limit the risk, and I had demonstrated that taking advantage of some of the latest developments in easy-to-use Internet technologies would preclude hiring large groups of people and raising lots of money when starting a business. In fact, in some cases, that might be detrimental. I also wanted to dispel the notion that businesses with a small number of employees by definition had to be small in profits as well. When business owners are asked how many employees they have, if they say "none," up until the past few years, there has been an assumption that it's a small business. That is no longer true. The reality is that people are leveraging technology either on their own or in very small groups to create substantial businesses. I believed that this group needed to be empowered. GMJ: Do you think there are certain attributes that successful entrepreneurs share? Judson: I believe that you have to have a number of traits to be successful. You have to be open-minded and have the ability to learn. You get your business up and going as fast as you can with as much flexibility as you can, and you learn and experiment. I encourage people to spend one or two hours a day on experiments, which I define as new ways to do things. Determination and responsibility are essential. In the corporate world, you can try something, and it may fail for reasons outside of your control. Yet you may be recognized for trying something terrific that should have been successful, and in fact, you may be promoted. When you're on your own, for better or worse, there is no "A" for effort. If what you're doing doesn't work, you still have to pay the mortgage. You have to accept responsibility for whatever happens to you. And you must have confidence in yourself. If you are launching something new that is substantial, it means you had an insight that someone else didn't have. It requires a certain confidence that says "I'm right." GMJ: Doesn't it also require that we are honest with ourselves about who we are, what talents we bring to the table, and where we may need some shoring up by complementary partnering? Judson: Exactly right. People should outsource the things they are not good at. And by outsourcing, I don't mean sending work offshore. Rather, it means finding others to do the things you don't do best, then spending a lot of your time on the things that you do well. Success requires continuous learning, and that doesn't happen unless you are doing what you do best. It's a super-competitive world. The odds of succeeding are much higher if you are doing something that you do best because you're more likely be doing something great. GMJ: If you could change one thing about the typical American workplace, what would that be? Judson: I believe we have lost trust. We have been through a whole series of events that have increased the perceived risk of working in corporate America. First, it was re-engineering and layoffs. Then we went through scandal. Now we have gone through scandals and bankruptcies that have pension implications. Not only am I at risk that I won't have a job, but the pension I may be counting on may be gone. People are thinking, "If life is riskier, then I want more control over those risks." The loss of trust feels like the central thing. Added to that, there is an exacerbation of the division between rich and poor, and corporate America is feeding that. It used to be that if you didn't found the company, you shouldn't expect to make twenty million dollars a year or more. If you founded the company, maybe you could. But now, that expectation has become increasingly prevalent. That is reverberating throughout the workforce and creating dissatisfaction among people who are struggling and working hard. 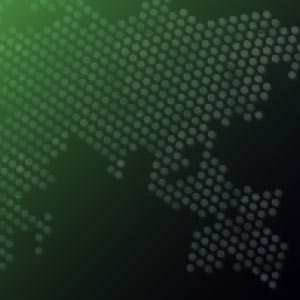 GMJ: Where do you think technology is taking the global workplace? Judson: Everything is exploding into its component parts. You see all kinds of things separating. For example, if I'm a product creator or product producer, I may be able to hook my system into your manufacturing plant so that I can tell whether my goods are being made, when they're being made, and that quality control is being maintained, etc. I no longer necessarily need to own the factory. We're seeing an explosion of smaller businesses -- smaller pieces of the chain -- and they are doing only what they do best. Technology is allowing that to happen. GMJ: You have recently discovered your top themes of talent with the Clifton StrengthsFinder assessment. How do you see yourself using some of your Signature Themes in a typical day -- or in your career? Judson: I use my Focus talents every day, almost to a fault. I say, "I must accomplish this first" before I do anything else. And I try not to let anything get in the way of that. For example, we live in a world where people expect an instantaneous response to e-mail. I set a three-day time horizon for myself. Unless it's central to what I am doing or something absolutely critical, I don't feel I should let someone else set my agenda. If I do, then I'll never focus. We've already talked about Learner talents and their value to a successful entrepreneur. The notion that a successful entrepreneur has to constantly be learning is central to Go It Alone! and to my own daily routine. I am fortunate that I am a fast reader. So, I typically read three to four books a week, and while driving, I listen to audiobooks. My Achiever talents always push me to accomplish more. A successful business is a repeatable business. Very few people take their business to its final degree. Entrepreneurs should be asking, "OK, this is working. But can I double it again, can I increase it again by 50%, and what would I need to do that?" Once your business idea is working, this is how you succeed beyond your imagination. "Using my strengths is so clearly unplanned," says Bruce Judson. That's essentially what many successful people say when they're asked to ponder their innate talents. When high achievers do what they do best, it just seems to come naturally to them. To learn more about his own talents, Judson recently took the Clifton StrengthsFinder, an online assessment that reveals people's top talent themes. Here are his "top five," followed by Gallup's short descriptions of the talents associated with these themes. Maximizer: People especially talented in the Maximizer theme focus on strengths as a way to stimulate personal and group excellence. They seek to transform something strong into something superb. Strategic: People especially talented in the Strategic theme create alternative ways to proceed. Faced with any given scenario, they can quickly spot the relevant patterns and issues. Learner: People especially talented in the Learner theme have a great desire to learn and want to continuously improve. In particular, the process of learning, rather than the outcome, excites them. Focus: People especially talented in the Focus theme can take a direction, follow through, and make the corrections necessary to stay on track. They prioritize, then act. Achiever: People especially talented in the Achiever theme have a great deal of stamina and work hard. They take great satisfaction from being busy and productive. Who better to predict where the Net is heading than one of its creators, Vinton Cerf? In this wide-ranging interview -- the first of two parts -- Dr. Cerf tells how the Internet was born and how it will continue to impact business in the future. He also weighs in on the social implications of his invention.